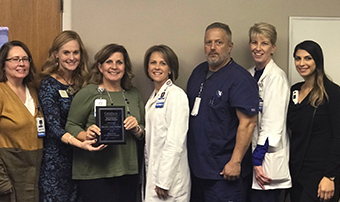 In addition to the staff honor, Ryan received the Preceptor of the Year Hospital Introductory Pharmacy Practice Experience (IPPE 3) Local award. Ryan precepts Creighton pharmacy students for Hospital Introductory and Advanced Pharmacy Practice Experiences and serves as Director of Pharmacy at Methodist Jennie Edmundson Hospital. When describing their experience with Ryan, students said that she “was professional and enthusiastic about our learning” and “always had something for us to do to enhance our learning, whether it was a drug information project, shadowing a pharmacist, or attending hospitalist rounds.” They also described the “Huddle” and how exciting it was to see the pharmacist work as part of the health care team. Students also appreciated how Ryan and the rest of the pharmacy staff at Methodist Jennie Edmundson listened to the students’ needs and accommodated them.